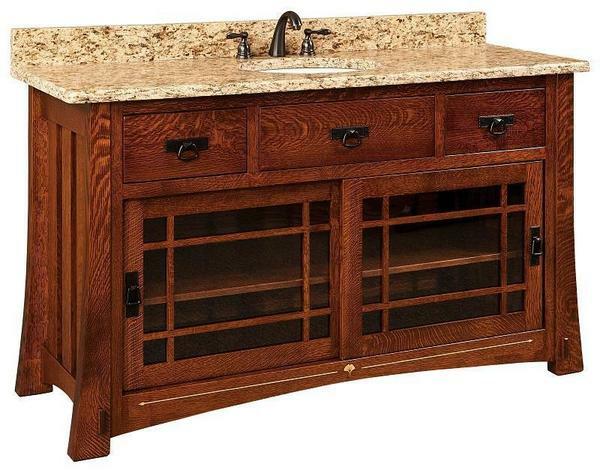 Renovate your bathroom with this stunning Amish handcrafted Morgan Single Bathroom America Vanity Cabinet with Inlays. Order a matching mirror to have a cohesive look. Check out all of our bathroom vanities to order your favorite look. Recreating your bathroom is easy with a new bathroom vanity cabinet. Custom woods are also available upon request. Sidesplashes Available for Additional Cost. Call for Pricing. Shown in Quarter Sawn White Oak Wood with CF 7992 Asbury.Juperano Gold Dark Granite top. We ordered two of these: One for our powder room, & the other for a small guest bathroom. Perfect size, craftsman style & quality. It is beautifully built & finished. We liked the open shelves for storing tissue, hand towels, & necessities for guests to easily see/access w/o having to look into a closed cabinet for those items. These are truly mission/arts & crafts style and quality.